The final ball has been kicked in what is widely regarded as one of the most entertaining World Cups in history. Viewers across the globe have been treated to the very best that football can offer, with stunning goals, contentious VAR decisions and it nearly coming home with England. The tournament has created huge topics of impassioned conversation across online social platforms that has offered organisations and influencers the perfect opportunity to deploy impactful marketing campaigns and build brand awareness. 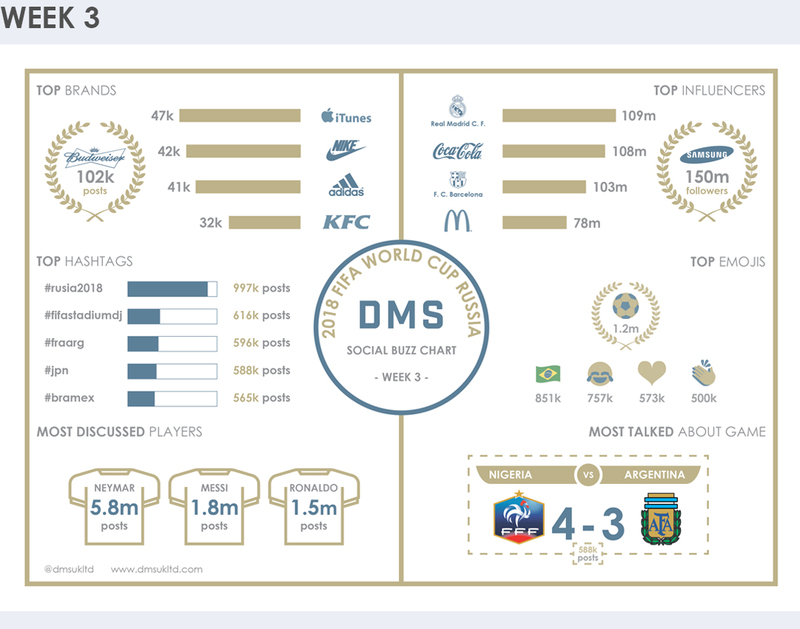 Throughout the tournament, the DMS Social Media Insights team has tracked and monitored a range of topics and influencers to highlight who has been performing best off of the field. 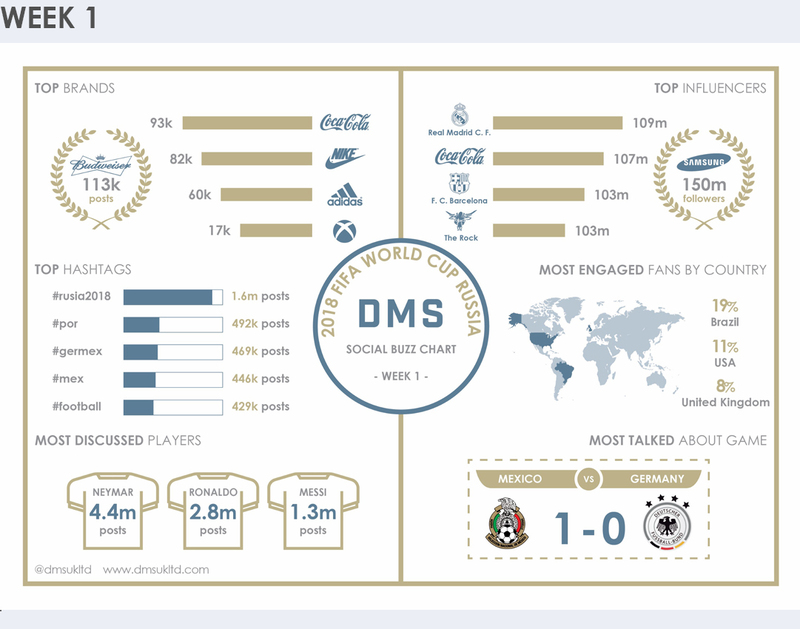 Our Head of Social Media Insights, Anna Zaikina and her team have looked at the most talked about games, players, top hashtags and tracked the brands receiving the most attention – offering some very interesting results. As you’d expect from global superstars, Neymar, Cristiano Ronaldo and Lionel Messi were the top three most discussed players with millions of posts including their names – even after their teams were knocked out! Typically, #Rusia2018 (Spanish spelling) and #fra were among the top five most popular hashtags, as well as South Korean boy band BTS taking two of the top five spots with #btsxfifaworldcup and #fifafakelove. Throughout the tournament, the top hashtags for each week generally featured the most talked about games of that seven day stretch with #germex, #gerswe, and #bramex amongst them. To monitor conversation and trends, the team did a lot of planning prior to kick off, setting up key words and hashtags within the analytics software to pick up the number of mentions. Every category of insight was tackled in a slightly different way using a combination of official hashtags and user handles, as well as exploring more common ways in which certain brands, games and players are talked about. 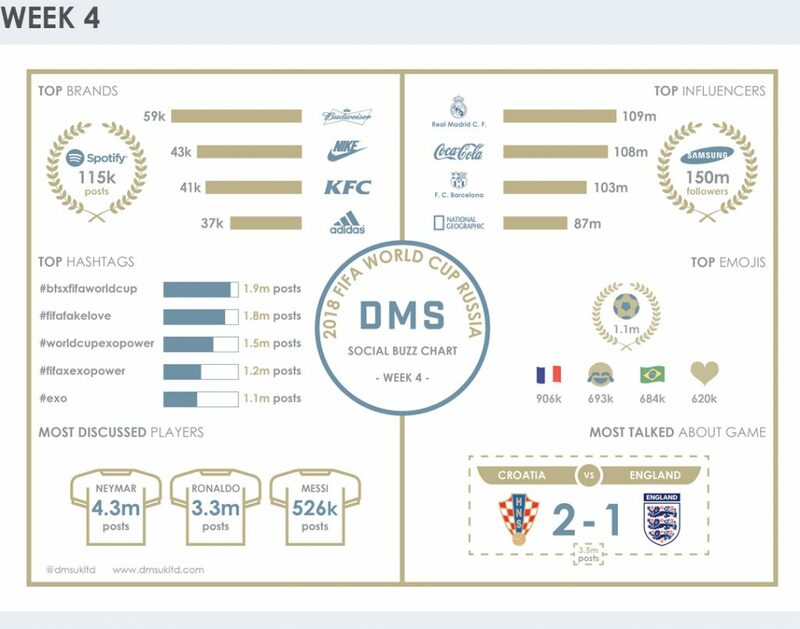 The World Cup is the ideal opportunity for marketers to build campaigns during the event and tap into or create and influence conversation to build brand awareness. 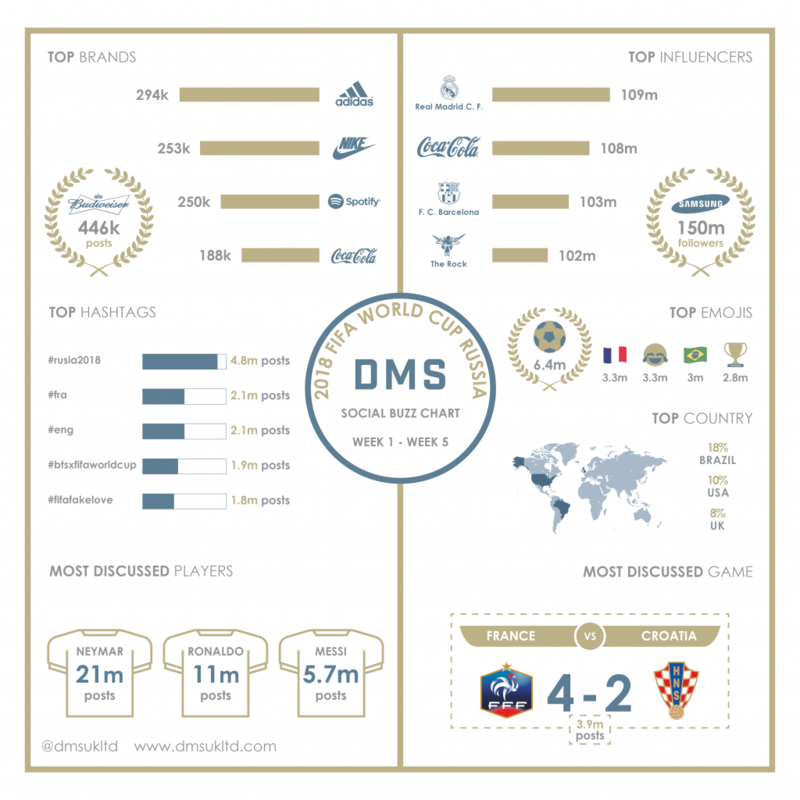 The tournament saw a range of influential brands competing for the most conversation, and as the monitoring results show, some created very effective engagement. 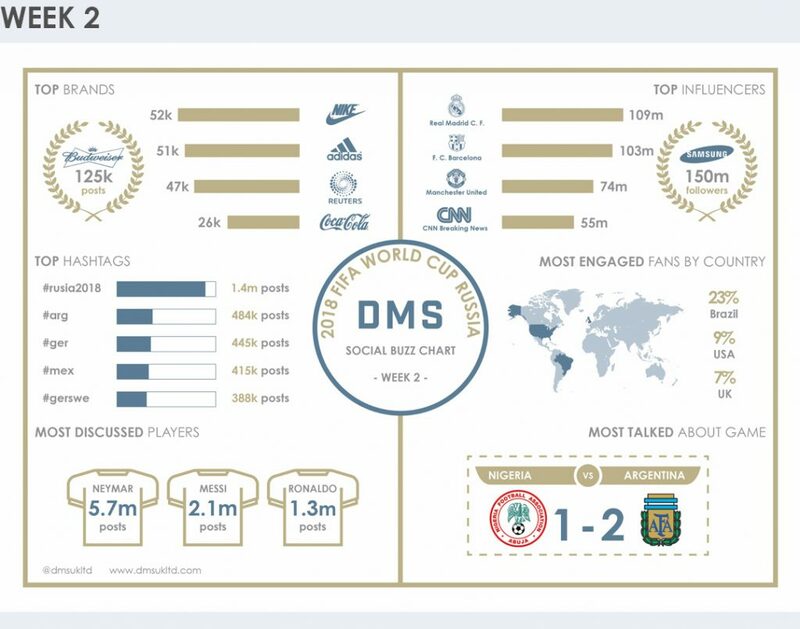 Budweiser, Adidas and Nike were the top three most engaging brands throughout the month, with Budweiser finishing on top, for the majority of the tournament. While Samsung was the most influential of the brands due to their huge following, as they interacted with over 150 million Facebook followers, with Real Madrid and Coca-Cola close behind boasting 109 million and 108 million Facebook followers respectively. Interestingly, the data shows that influence can be defined in various ways. While many brands that were top influencers had a huge social media following, those most mentioned and engaged with were not necessarily the ones with the biggest number of fans. Depending on the desired outcome of the brands engagement, it is important to consider the ratio between reach and engagement. Wider reach and awareness can be achieved more efficiently through brands with millions of followers, while a niche brand or influencer is likely to have a more focused and engaged fan base on social. This type of social media analysis is invaluable in identifying the wider industry trends as well as potential partnerships with brands, influencers and celebrities. As seen in More About Advertising.